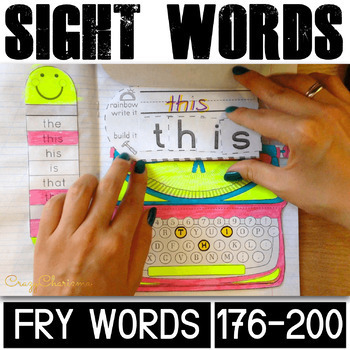 Interactive Notebooks have always been a fun way to introduce, practice and review sight words. Use these typewriters with your kids as engaging reading strategies. This packet contains 59 pages which are easy for the students to understand and perfect for Kindergarten and Grade 1. 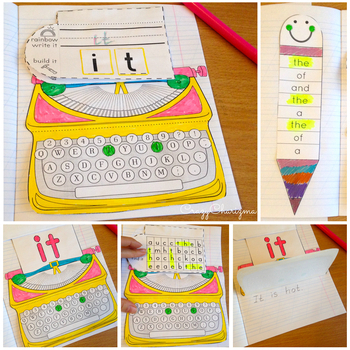 Let your kids work with these adorable typewriters and become great writers while they are dealing with these sight word activities! You might want to check ​them​ out first! What does this interactive resource contain? 1.”Type" the word highlighting the letters. See the VIDEO of how the packet is used. Download preview for more details. ✔ Earn TPT credits: Did you know you can earn 1 credit for each dollar that you spend? After you tried and used this packet in your classroom, please give a rating and leave a short comment for the packet. I appreciate it very much! ✔ Customer Service: If you have any questions, please feel free to email me or use the Ask a Question feature on TpT. I want to provide quality products to help teachers and students alike, so contact me before leaving feedback if you have a need. ✔ Buy for your friend: If you want your friend or the whole team to have and use this product, you need to buy a multiple license to share it with them. Each additional license goes with a discount!